I’m not an overly patient person, but it’s true I have stood on line for many a culinary delight, the majority of which have been restaurants, food trucks, and possibly a celebrity-chef cookbook signing. 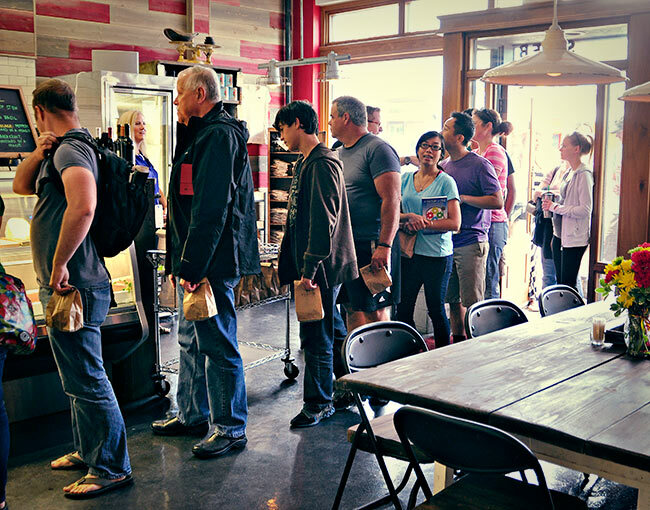 I have not, however, often stood on line waiting for a butcher to open, so I was surprised (pleasantly) when I turned the corner of Cottage Avenue and San Francisco Street and saw a long line of people waiting outside the soon-to-open boutique butchery, Proper Meats + Provisions in Flagstaff, AZ. I was lucky enough to score a media invitation to the Grand Opening of Paul and Laura Moir’s newest addition to their SLO Restaurant Concept (Susatinable. Local. Organic. ), and I felt a bit sheepish slinking past the long line of patiently waiting customers and into Proper an hour before the official opening. I needn’t have worried much about insults and/or empty beer bottles hurled in my direction. Folks in northern Arizona are both pleasant and patient. They’d been waiting for some time for a butchery of Proper’s kind to come to them, and one more hour wasn’t going to kill them. Proper, along with “sister” operations such as Criollo Latin Kichen (hand-crafted, Latin-inspired local cuisine) and Brix (a fine dining restaurant with an impressive wine bar) restaurants in Flagstaff, as well as the Proper restaurant in Tucson, is unique to Arizona in that it curates farm-raised meats, poultry and cured products sourced specifically within the Grand Canyon state. While the long-lost art of butchery is slowly making a comeback across the country, this is honestly the first butchery I’m aware of that is focusing on providing its customers products that are sourced solely from within the state it operates. That’s saying something about a state that is not necessarily known for its unique gastronomy. It’s that connection between the meat we eat and how it gets onto our plates that the team at Proper hopes to foster in people that want to be more in touch with their food. And after the past 20 to 30 years of being indoctrinated with the ideology of convenience and “one-stop-shopping”, it’s not going to be easy. “Hey, people are busy, probably busier now than they ever have been and we get that. There are days when it is definitely easier to pick up your meat and your toilet paper in the same location.” And while Proper is not on a mission to make people feel obligated to “do the right thing” and buy their products, they hope people will see the benefits of what Proper has to offer. One such benefit is that Proper is able to offer not just a sustainable, organic meat such as beef, but because they’re sourcing their beef from a variety of Arizona farms, they can offer a variety of beef. “We’ll be offering not only rib eye, but three or four variations of rib eye,” Chef David explained. “People will notice the difference in the way the beef looks, how it cooks and how it tastes – and they’ll be able to come back and purchase their favorite time and time again. They’ll have more options available to them than they would ever have with even the highest quality beef selections available to them from their local grocery store.” This may not matter to 100% of the population, but it’s obvious it does matter to a higher and higher percentage than ever before. Choice is good. If you’re feeling peckish after making your fresh meat selections, take advantage of Proper’s freshly-made soups and sandwiches. My suggestions would be the pork shoulder banh mi and the smoked whitefish salad sandwich, but I’m a bit of a wild child. As northern Arizonians residing in a smallish town, it’s no secret that we all must travel south to Flag from time-to-time to stock up on more hard-to-find supplies. Don’t let that expanded carbon footprint go to waste – a visit to Proper most definitely should be on the list.